Blog post with extensive pictures investigation claims 200th Independent Motorized Infantry Brigade took part in Eastern Ukraine war. The three soldiers at the military garrison at 19 km in the Pechenga valley near Russia’s border to Norway should have covered the yellow unit number on the military vehicle they posed in front of. The armoured transporter of the MT-LB-BMK type with yellow painted tactical unit number 797, was captured on film outside the city of Lugansk in Eastern Ukraine in August 2014. In Pechenga, where the 200th Independent Motorized Infantry Brigade is based, yellow identification numbers have never existed. Neither have the numbers in the series of 700s or 800s. Until now. Military vehicles in the Pechenga vally are well known for civilians driving through. The highly visible garages and parking spots for armoured transporters of the brigade is only a few metres from E105, the main road between Murmansk and the border to Norway. 797 is just one of several military vehicles from 200th Independent Motorized Infantry Brigade that apparently took part in the battles in Donbass in late August 2014, according to a thorough and investigative blog posted on LiveJournal. This, and many more photos from Pechenga were originally posted on the Vkontakte profiles of soldiers serving with the brigade. The original selfie of the soldiers in front of unit 797 was posted on this Vkontakte link. 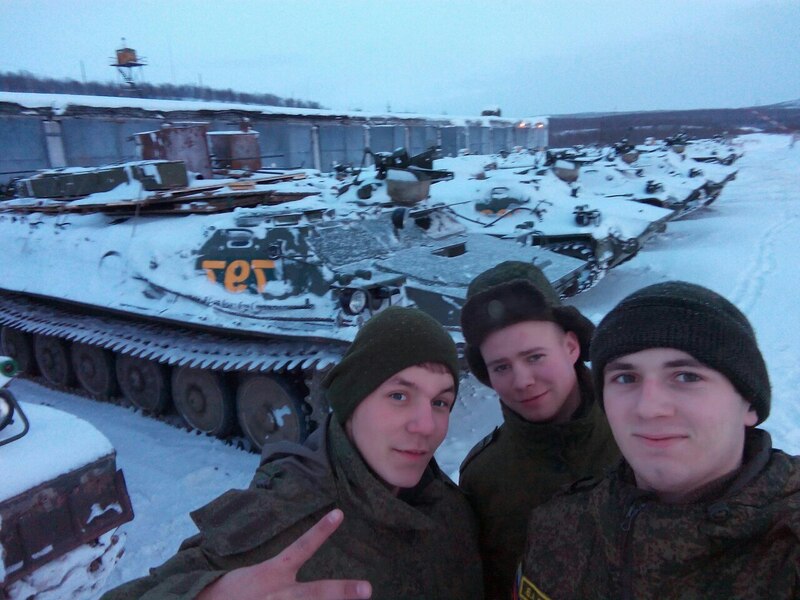 LiveJournal now presents a comprehensive list of picture evidence that vehicles that were in Eastern Ukraine during the battles now are back with the brigade on the Kola Peninsula. Photos are compiled from TV-films as well as soldiers own personal photos posted on their profiles at Vkontakte, Russia’s most popular social media. 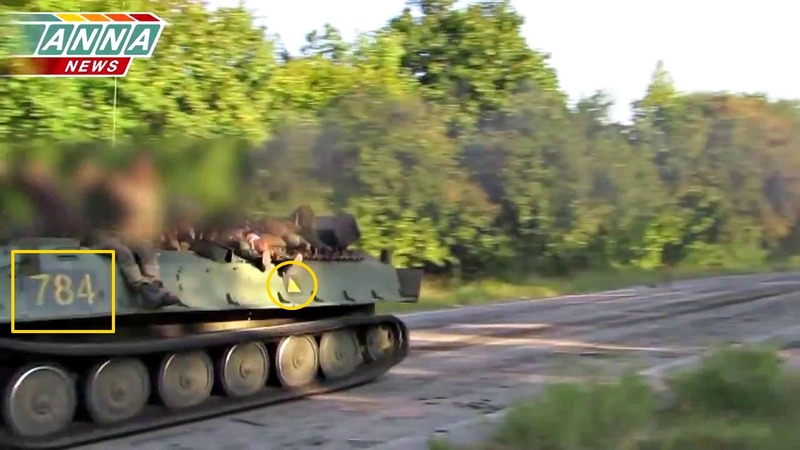 In addition to the yellow unit numbers, several MT-LB-BMK vehicles at 19 km in 2015 suddenly had yellow tactical signs painted on their hull. According to the blog-post on LiveJournal, the vehicles in Pechenga have tactical symbols of a white square, with either an equilateral circle, triangle or a square inside. 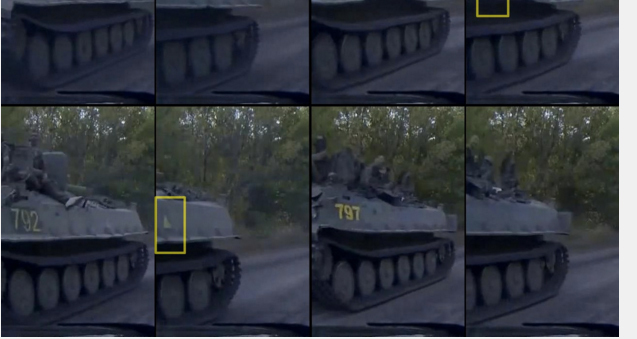 Before going to Ukraine, these identifications were all painted over and replaced with a yellow triangle. This is done to minimize the chance of accidentally shooting at their own troops in combat situations. This was especially important in Eastern Ukraine as Ukrainian state forces had similar Soviet made equipment. The problem, as it seems, was that the yellow triangle signs and numbers were not painted over again as the military vehicles were returned to the north. The photos presented show not only armoured transporter of the MT-LB-BMK type, but also tanks. In total, 16 military vehicles from Pechenga are listed in the LiveJournal blog. The 200th brigade in Pechenga consists of a tank battalion in Luostari, three motor rifle battalions at 19 km and in Pechenga, also with artillery divisions and a military intelligence and a sniper division. The brigade also has two anti-aircraft divisions, which vehicles also appeared to have been in the Donbass region in August 2014. In his annual press conference in December, President Vladimir Putin for the first time admitted the presence of military personnel from Russia in Eastern Ukraine. “We never said there were no people there who carried out certain tasks, including in the military sphere,” Vladimir Putin told the journalists.